Cross Star Wars Series Pens Available Now | Nerd Much? If you consider yourself a nerd and yet also a connoisseur of fine writing utensils, we’ve got something surely right up your alley. The Cross Star Wars series pens have been revealed today, offering 6 different Star Wars themed designs. 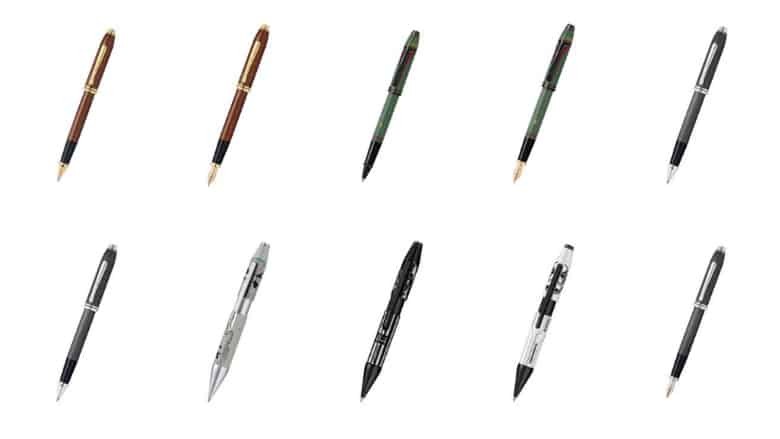 The Cross Star Wars series pens come in designs inspired by Chewbacca, Boba Fett, Han Solo, the Millennium Falcon, Darth Vader and a Stormtrooper. With several of those have a variety of options to choose from. The Chewbacca pen comes in either the Rollerball or Fountain pen style. It boasts a mahogany brown lacquer finish with deep-etched engravings. And it also sports 23 karat gold-plated appointments, and an inset brilliant-faceted Swarovski smoked topaz crystal. The Boba Fett design also comes as either a Rollerball or Fountain pen tip. The design features a semi-gloss army green lacquer with deep-etched character-themed engravings, polished black PVD appointments, and an inset. As for the Han Solo Rollerball and Fountain pens, these Cross Star Wars pen designs host a gunmetal gray PVD plate finish with deep-etched engravings, rhodium-plated appointments, and an inset Swarovski jet hematite. The Chewbacca, Boba Fett and Han Solo Cross Star Wars series pens are considered limited editions. Only 1,977 of each were created and individually serialized to commemorate A New Hope’s 1977 release. But with their rarity comes a much steeper price point. The Rollerball styles list for $450 each, while the Fountain pen tip design will run you $575 each. Though they also come with a keepsake box and pen stand, as well as a Star Wars collector’s booklet detailing the character for whom the pen was designed. There are a few other non-limited edition Star Wars series pens available too. These are much more affordable at $85 each, but they don’t come with the bells and whistles that the collector’s editions do. The Millennium Falcon, Darth Vader and Stormtrooper designs are the three available here. With each of the trio only being available in a Rollerball style. Cross offers free shipping on orders over $49.99, so they’ve got you covered there. You can check out all the designs within the Cross Star Wars series pens set here.